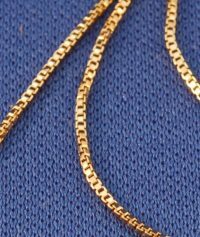 We have true Sterling Silver chains as well as silver plated and rhodium plated chains to go with our silver pendants, while our gold chains are either Hamilton Gold Plated (the most durable kind), or Gold Filled, which will last almost as long as solid gold. NOTE: Many of our pendants list optional pendant/chain combinations that are $3 less expensive than if you buy them separately. 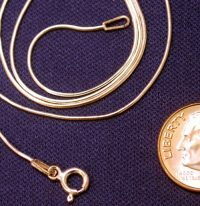 However you will find several chains on this page that are not offered as a set – especially in shorter lengths and fancier links. These are often in limited supply, so grab them while you can. Please note that prices can change rapidly do to the current volatility of the silver and gold markets.